Cthulhu is the best-known and most remembered of the Lovecraft Mythos pantheon of Elder Gods, those “Great Old Ones” who once ruled Earth, but have—for the time being—been exiled to a point past the fartherest star. “. . . in his house at R’lyeh dead Cthulhu waits dreaming . . .“ and when a specific alignment of stars and planets occurs, he will awaken and open the way for the Old Ones to return. In the creation of Cthulhu—great priest of the Elder Gods, with the power to drive men mad through their dreams—Lovecraft definitely succeeded. In the past 88 years, with his first appearance in the February 1928 issue of Weird Tales, the creature has made a niche for himself in readers’ imaginations. Cthulhu is always part of other stories in Lovecraft’s universe, and if he doesn’t have a starring role, he nevertheless hovers in the background, a menacing off-stage presence still able to drive other characters insane merely by his existence. 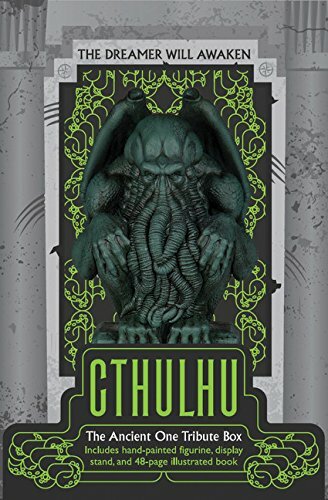 In this very short volume—only 44 pages—is assembled a concise history of Cthulhu, along with the many authors whom he and his creator have influenced: from Robert Bloch to Stephen King. Also featured are full-page artworks showing various artists’ conceptions taken from Lovecraft’s deliberately vague description, each adding his own interpretation to the mix, for what better way to make something completely terrifying than not to go into detail? The booklet carries a great deal of facts and information in a small space. The sculpture, “suitable for fear, worship, or dark contemplation,” sits (or crouches) in an ornately designed box also housing the booklet. It also comes with a stand for display on bookshelf or mantel. It’s a suitable gift for horror authors but would no doubt also be a welcome presentation for the weird tales devotee as well. All in all, this little set is a tribute to one writer’s imagination, driving home the fact that a man’s accomplishments may long survive himself.